Kem cards are the finest playing cards available, they are made of thermo-plastic materials that are virtually tear-proof and washable. These cards will last for years and if one should get damaged Kem will replace it for free. 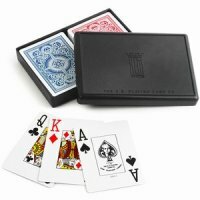 The wide index cards are presented in a black card case containing 2 packs of cards with arrow design. One pack is blue the other is red. 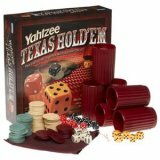 For high-rolling, high-stakes fun, you can't beat the winning combination of Yahtzee and Texas Hold'Em poker! The trick is to make the best 5 dice 'hand' from your 2 personal pocket dice and 5 up for grabs dice. Each roll could shift your strategy: will 2 pair become 3 of a kind or a full house? Will you go for the broke with an all in bet? At showdown time, the player with the best poker hand wins the chips. The ultimate hand is a yahtzee flush: 5-of-a-kind in the same colour 'suit'! Perfect collection of poker gear for the Jack Daniel's lovers among us! A fantastic starter set displayed in a quality windowed tin and emblazoned with the Jack Daniel's old No. 7 branding. 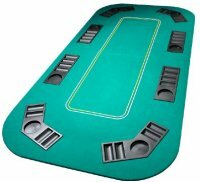 If you want to play your home poker games in a more professional environment, but you dont want to invest in a full-size table, this Texas HoldEm Poker Table Top is the ideal solution. Measuring approximately 800mm x 1650mm, it will transform your dining room table into an eight-player poker table. Features include: Seating space for up to eight players One built-in drink holder for each player A quality green felt surface Folds in half for easy storage and transportation And as if all of that isnt enough, it even comes with a free carry bag! The new Maytag Handy Chiller is the fastest way to chill drinks. The patented process is 40 times faster than a freezer and can cool:  Cans in 1 minute,  Wine and Bottles in 3.5 minutes and  Super Cool bottles in 6 minutes. Just add ice, water and plug in, you will never run out of cold drinks again. Ideal for parties, entertaining or whenever you desire a cold beverage at a moments notice. This versatile unit may also be used to warm babies bottles to a safe drinking temperate in two minutes. Available in sleek and stylish silver and black to ensure that it will look the part in any kitchen. Super smart aluminium chip case available in either 300 or 500 capacity. Includes quality clay style 11.5gm 'suited' numbered (one side) poker chips like the ones used in real casinos, 2x packs of Vegas casino cards and poker dice. If you want a quality product that will impress then look no further. 300 capacity case measures 400x200x60mm. The ultimate set of poker chips now available in the UK! Housed in an aluminium attaché case, these superb 11.5gram chips are available in 5 denominations. Each chip has a full colour image heat transfered onto it. Professional poker chip case made from aluminium giving it an ultra modern styling. Will hold either 300 or 500 of our 40mm poker chips. A lot of poker players like a smoke, so this little beauty will sit neatly on your gaming table. Re-fillable lighter housed in a ceramic case (the dice). Top off your card night with one of these professional neon signs. Housed in a clear perspex box, this neon sign can be wall mounted or free standing. There is nothing more exciting in a casino than the spin of a roulette wheel and we have searched the globe for different roulette wheels and have found only one company to offer a top quality wheel at a competative price. Direct from Las Vegas these dice may have lost or won millions. Precision cut to 0.0001 inches in translucent red you would never even know they had been used! All dice come with the casino logo they were used in. Current stock from the Aladdin Hotel, Horseshoe, Harrah's and other Vegas casinos. Semi-professional tough dark green cloth. 36" x 72" To compliment your Blackjack games why not add a Card Shoe made from tough clear acrylic. This shoe will feel like a professional unit holding upto 4 decks of cards and with a heavy metal roller. Gift boxed. Casino cards are often only used up to a few hours and sometimes cards are changed without ever being played. These cards are of excellent quality. Current stock from New York, New York, Paris Hotel, Bally's, Caesers Palace, Rio, Bellagio, Mirage, Orleans & Golden Nugget in Las Vegas. If you have a preference to colour please state on checkout. Our full range of professional 2 colour clay striped chips can be found by clicking on the image. Now with a full complement of numbered chips !